MAKATI CITY (19 March) – Though for only a short while, yesterday I was able to drop by the ribbon-cutting ceremony of a new social enterprise in Cotabato City, led by no less than the incumbent city mayor, Atty. Frances Cynthia Guiani-Sayadi, as the guest of honor. Beyond its acclaimed feat of “brew and books,” Café Mindanaw is indeed a showcase of Mindanao coffee and foods, books and old photos, traditional music and artifacts. In short, it is a perfect place to nourish one’s body, mind and spirit combined together. While savoring native cuisine for free, the most refreshing for me was the rare presence of Gawad Manlilikha ng Bayan-awardee (National Artist) Bapa Mael as he fascinatingly serenaded the jubilant visitors with the mystical sound of his ‘palendag’. Also called ‘pulalu’ (among the Manobos and Mansakas), ‘palandag’ (among the Bagobos), ‘pulala’ (in Bukidnon), and ‘lumundeg’ (among the Banuwaens), the ‘palendag’ is a kind of bamboo flute in the Philippines, the largest being used by the Maguindanaons. 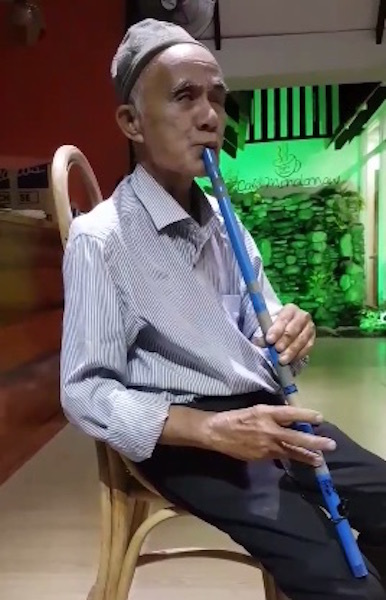 Being a lip-valley flute, it is regarded by music experts as the toughest of the three bamboo flutes (the others being the ‘tumpong’ and the ‘suling’) to play due to the way one must shape his or her lips against its tip to make a sound. Accordingly, the construction of the mouthpiece is such that the lower end is cut diagonally to accommodate the lower lip and the second diagonal cut is made for the blowing edge. In the parlance of Maguindanaon and other vernaculars, ‘palendag’ literally means ‘wailing,’ ‘lamentation’ and ‘crying for grief’. It symbolizes the cry of the bamboo stalk (which was turned into a flute) as it was cut off from the bamboo ‘tree’. It symbolizes complaint of separation and longing for return to one’s roots. It represents uneasiness for being driven away from one’s comfort zone and the corollary desire to regain this lost comfort. Simply put, it is a litany of unwanted rupture and yearning for union. What’s the secret behind the melancholic sound of ‘palendag’? In Islamic mysticism (‘irfan), this flute’s lamentation is a symbol of the soul’s sorrow at being parted from the Divine Beloved. This is exactly the subject of the first poem – “The Song of the Reed” – of the four-volume Mathnawi-ye Ma‘nawi (Spiritual Couplets), which is the Persian magnum opus of the classical Muslim poet-mystic Mawlana Jalaluddin al-Balkhi, better known in the Western world as ‘Rumi’. Men and women all have lamented my bewailing. So that I may fully declare the agony of yearning. None sought to discover the secrets in my heart. Whoever possesses not this fire, let him be naught! It is the surge of love that bubbles in the wine. He who lacks his daily bread, for him the day is very long. Wherefore my words must be short, and now, farewell! The Politics of Hermeneutics or the Hermeneutics of Politics? When I was translating into English a book on the untold story of freedom a decade ago, I encountered for the first time a hermeneutically enigmatic couplet of the great Persian poet-mystic Jalaluddin al-Rumi whose 800th birth anniversary was commemorated by UNESCO on September 2007 and whose magnun opus, Mathnawi-ye Ma‘nawi (Spiritual Couplets) was first translated into English in full by Reynold A. Nicholson in 1925-40. That one is ‘shir’ [milk, or lion] in the ‘badiyeh’ [cup, or jungle]. And the other one is ‘shir’ in the ‘badiyeh’. That one is ‘shir’, which devours human (or, which human eats). And the other one is ‘shir’, which devours human (or, which human drinks). The word “shir” means “milk,” as well as “lion”. “Badiyeh” also denotes two meanings: the first one is “desert” and the other is “cup” or “vessel”. In this couplet, it is not exactly clear which one is “lion” and which one is “milk”. Badiyeh is equally not clear which one means “desert” and which one means “vessel” or “cup”. This Rumian style is inherited by Maguindanaons, though in a simpler but somehow blunt fashion. When a curious child would ask about the identity of something an adult Maguindanaon is holding, it is not uncommon for the latter to say, “Ut_n na midsa.” Usually, the former would demand clarification, “What is midsa?” but receive only one-word reply, “midsa.” So, he would suppose that midsa is a kind of animal, but years later, he will realize that midsa means ‘one who asks’ and therefore referring to himself! In interfaith circles, ‘dialogue’ could mean different things. In mid-1980s Durban-based Ahmed Deedat took issue with the Holy See for evincing his willingness to have ‘dialogue’ with Muslims when, accordingly, he meant something else, and therefore, challenged him to a ‘dialogue’ in St. Peter’s Basilica without realizing perhaps his own use of the same word (dialogue) that also means something else, i.e. ‘debate’—and possibly an acrimonious one. In 2000 two medical doctors, Dr. William Campbell and Dr. Zakir Naik, engaged in a religious ‘dialogue’ which every neophyte member of a university debating team can easily identify as actually a debate. During the Cold War era, the ‘subversive’ or even ‘activist’ (read ‘communist’) was the favorite villain in the ‘free world’. Shortly after the dismemberment of the strongest bastion of communism in the world, the ‘subversive’ or ‘activist’ was soon replaced by the ‘Islamic fundamentalist’ or ‘extremist’. After the 9/11, it is the time for hunting down ‘terrorists’. It is interesting to note that Jason Burke dedicated his informative book on Al-Qa‘ida—his first written book—on the victims of both ‘terror’ and the ‘war on terror’. 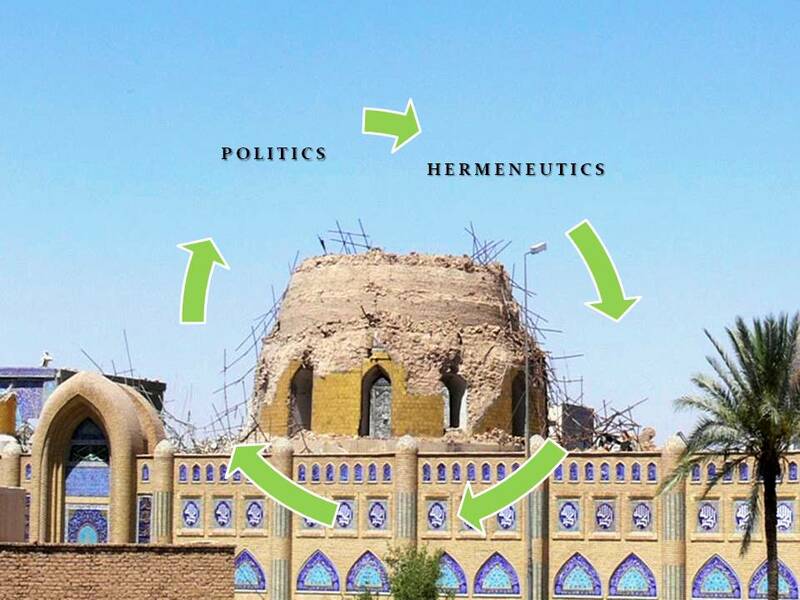 Since the occupation of the war-rampaged Iraq in 2003, this politics of hermeneutics or hermeneutics of politics—depending on one’s reading—has its own version: the hermeneutics of rafidah with the aim of throwing two birds with a single stone. Literally means ‘one who rejects’, rafidah (plural rawafid) is translated as ‘heretic’ and its derivative modifier rafidi as ‘sectarian’. For centuries and especially more recently, it is increasingly used as a pejorative designation for a Muslim sectarian group demographically the majority in Iraq since its British-midwifed birth in 1920. Until the fall of the Ba‘ath regime in 2003, however, this majority had been persecuted and politically disenfranchised. How to convey a sectarian message totally comprehensible to adherents and at the same time capable of fending off outsiders’ accusation of the message’s advocacy of sectarian-based civil war and division of the ummah? The solution lies in playing with the ambiguity of the word rafidah. Vitriolic verdicts on the urgency of killing rawafid channeled through audiotapes distributed within the flock of votaries and downloadable at insurgent websites are coupled with everyday carnage of civilians in public places such as markets and houses of worship. Condemnation of these mass murders is immediately deflected by claiming that the targets are only the “collaborators working with the Crusaders”. Granting that police stations, military outposts and political figures are legitimate targets, why market-goers and worshippers are daily victims? Given this line of argument, one may wonder how and at which voting precinct the dome and two minarets in Samarra cast their votes for which they were condemned to destruction for two counts. Hence, the use of such word is truly a powerful bomb that must be detonated. In postmodernist parlance, this textual interplay at work requires either deconstruction or double reading, or both. 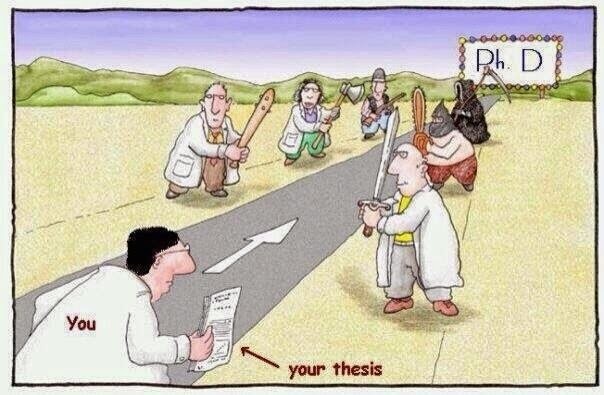 For Derrida and Foucault wannabes, this is a golden opportunity to test the validity of these twin tools. I just hope they would not discover and thereafter conclude that ‘deconstruction’ and ‘double reading’ themselves also require deconstruction and double reading.